Camille Claudel was born on the 8th of December, 1864. Her father, Louis-Prosper Claudel, was a mid-tier civil servant, and her mother, Louise Athanaïse Cécile Cerveaux, came from a respected Catholic family from the Champagne region. During Camille’s early years the family moved frequently – her father was constantly being reassigned to new posts throughout the North East of France. The itinerancy took its toll on the family, and frequent arguments found Camille siding with her father against her younger sister and mother (her younger brother Paul was happy to spectate). Camille was indisputably her father’s favorite, and he did his best through the family’s many moves to ensure that his children received a decent education. But tutors were never enough, and after a while, Louis-Prosper conceded his children must be sent to Paris. Louis-Prosper moved his children and their mother to Montparnasse in Paris in 1881, and recognizing early artistic talent in Claudel, he introduced her to the eminent Alfred Boucher. Boucher had been the gardener for Joseph Marius Ramus, and after showing his own talents as a sculptor, Ramus had opened his studio to him. By the time he met Camille, Boucher was an instructor and eager to offer advice and support to the next generation of artists. He introduced her to Paul Dubois of the Ecole des Beaux-Arts, but the Ecole was closed to women, and Claudel enrolled at the Academie Colarossi instead. Even at this early stage, Boucher recognized similarities between the work of Claudel and that of Auguste Rodin. Whilst at the Academie, Claudel worked out of a studio with several other young women, and Boucher would visit on a weekly basis to offer critiques. Camille Claudel’s early bust of her younger brother, Paul. Image Source: Le village Certi’Ferme. Claudel showed her skill long before she met Rodin, and the bust of her young brother Paul, styled as a Roman emperor, is a testament to her skills and abilities. In 1883, Boucher won a trip to Rome, and anxious not to renege on his duties, he asked Rodin to take over his weekly critiques in his absence. It was there that Rodin and Claudel first met. Rodin recognized Claudel’s talent immediately, and was also impressed by her ability, despite their difference in age of 24 years, to engage with him on both a technical and conceptual level. The critic Morhardt described as Rodin’s “sagacious and perspicacious” collaborator, and soon after their first encounter, Claudel moved her studio into Rodin’s. Over the following decade she worked on all of Rodin’s most celebrated pieces form The Burghers of Calais to The Gates of Hell, and even served as the model for The Kiss. Rodin’s Burghers of Calais, 1889. Image Source: Nineteenth Century Art. Rodin’s Gates of Hell, 1917. Image Source: Musée Rodin. Rodin’s The Kiss, 1882. Image Source: Musée Rodin. Claudel is credited with working on all of the hands in The Burghers of Calais and certain figures in The Gates of Hell. During this period, Claudel and Rodin became lovers, though their relationship was tempestuous. Rodin did much to help Claudel hone her technical skills as sculptor, and introduced her to a wide variety of new materials beyond those, which she had trained with at the Academie. But, at times, Claudel almost resented Rodin for his help, as though her own work continued to be well received and widely praised, many critics chose to attribute all of her excellence to her great teacher, Rodin. To make matters worse, Rodin refused to break off his relationship with Rose Beuret regardless of Claudel’s pleading. By this time, Claudel’s mother was also voicing her own dissent as she had never approved of Claudel’s career choice, and her staunchly conservative opinions certainly did not condone Claudel’s relationship with Rodin. The end began in 1892, when Claudel had an abortion, and immediately broke off intimate relations with Rodin. 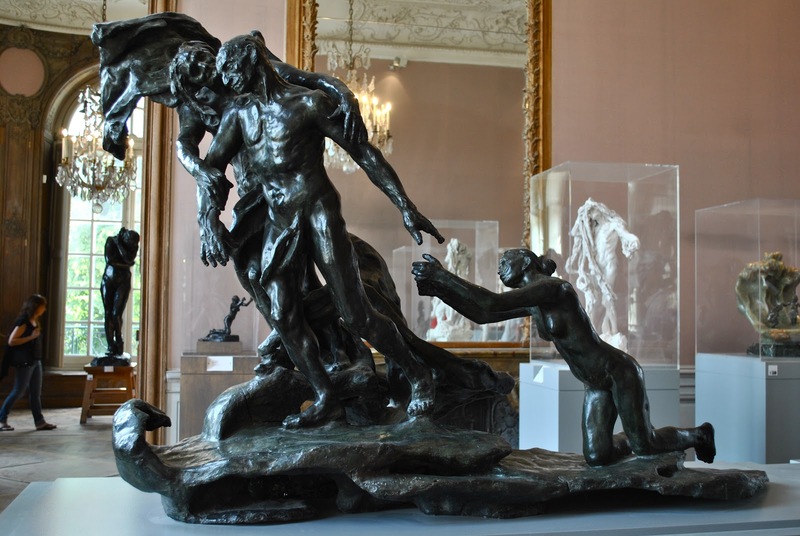 One of the most telling works of this period is Claudel’s Ripe Age, 1894, which her brother Paul recognized as representative of the breakdown of her relationship with Rodin. Claudel’s Ripe Age, 1902. Image Source: All The Old Dudes. The sculpture depicts the Mature Man being drawn away from the kneeling embodiment of Youth by the figure of Old Age. The figures represent Rodin, his mistress Beuret, and Claudel respectively. The sculpture is exceptional in its balance: it demonstrates the skill of Claudel in her ability to not only capture movement, but also emotion. The figures are frozen mid-stride, as though taken from a candid photograph by Cartier-Bresson, and their features express an added layer of emotional depth beyond their bodies. The kneeling figure of Youth’s anguished expression is coldly contrasted by the comparative indifference of the Mature Man walking away, and ignoring her outstretched arms. Four years later, their relationship fell apart completely when Rodin married Rose Beuret. Claudel was heartbroken, and suffered a complete mental breakdown. She began destroying her sculptures, and was diagnosed with schizophrenia. She accused Rodin of stealing her ideas, and was eventually admitted to an asylum in 1913. She lived out the remaining thirty years of her life in a variety of institutions. Her brother was the only one who visited her, though after the outbreak of World War II it became increasingly difficult for him to reach her. She died in Montfavet and was buried in a communal grave. Featured Image: Portrait of Camille Claudel. Image Source: Wikipedia.